We propose to have a late start after breakfast, a couple of walks, some firewood gathering and morning tea. I have a bacon sandwich for breakfast (something I never do). However, when we go to leave at 10:30 am, Robby's car has broken a fan belt. It is one of a dual pair of belts and it takes some time to get it off. It then takes ages to get the new belts on (as you need to change both) due to the fact that the alternator would not move more to enable fitment. It ends up taking 2.5 hours to change. Once we get back on the road (at 12:45 pm), we go to Kathleen Creek which is about 30 kilometres away where we stop of for lunch at 1:10 pm. 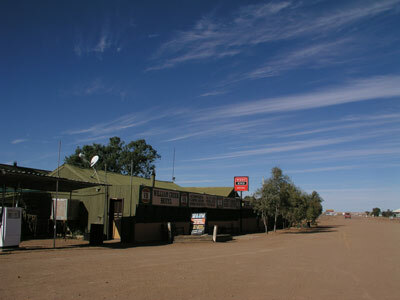 We are back on the track at 1:35 pm and we drive the 98 kilometres to Oodnadatta arriving at 2:55 pm. 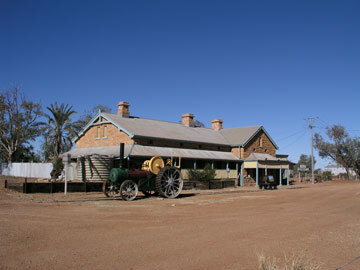 We have a beer in the Transcontinental Hotel ($4.70 a Pale Ale) and look at the famous Pink Roadhouse as well as the railway station that has undergone a very good restoration. We leave town at 3:35 pm and head south. The road for the first 25 kilometres is newish, having been realigned. 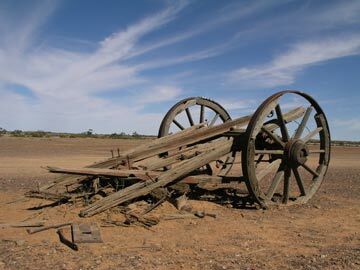 We stop at a couple of spots to look at the remains of the old Ghan Railway. 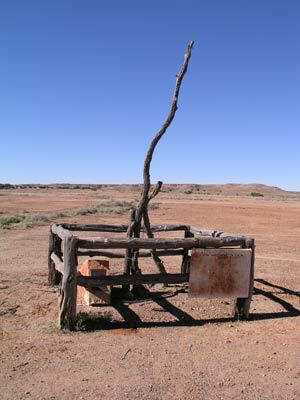 There is one remaining telegraph post from the old telegraph line to Alice Springs. 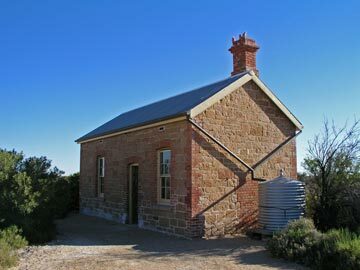 As well, there are railway worker cottages all along the Oodnadatta Track and some are very interesting to look at. I collect some rail spikes from one spot. 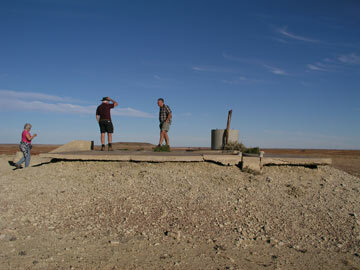 We arrive at the Algebuckina Waterhole at about 4:30 pm (it is about 60 kilometres south of Oodnadatta). We take some time to find a camping spot. There are some nice spots east of the track but the biggest is occupied. 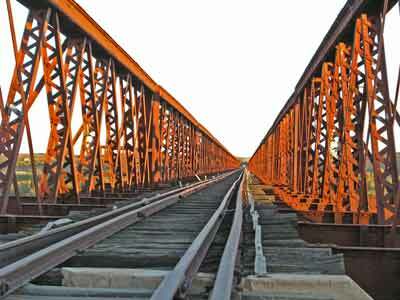 We then went west and find a spot between the road and the railway bridge. We start a fire as soon as we arrive as Elly is making us all a baked lamb dinner. We are supplying some pumpkin. After setting up our tent, Frank and I walk to the bridge to take some photographs. 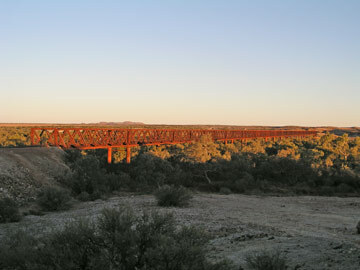 This is the longest bridge in South Australia and as the sun sets it looks great. There are also a couple of graves here, one is a person who drowned. 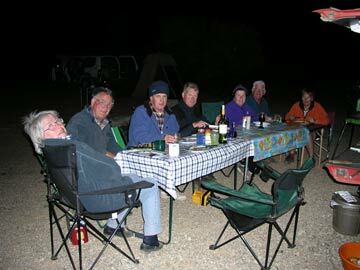 Back at the camp site, we have set up one long table with table cloth and we have a great baked dinner with potatoes, carrots onions, pumpkin and other veges. It goes down well with a nice white wine. We have pancakes for dessert. A great meal in a great location. It is very cold this morning, only 2°C. We have another later start as we do not need to travel far today. 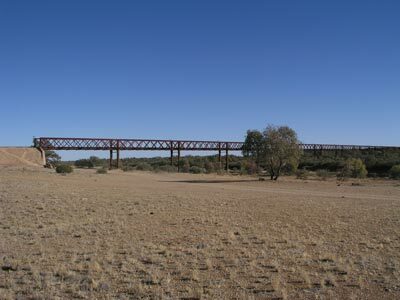 We go and have another look at the bridge from the south side of the creek. 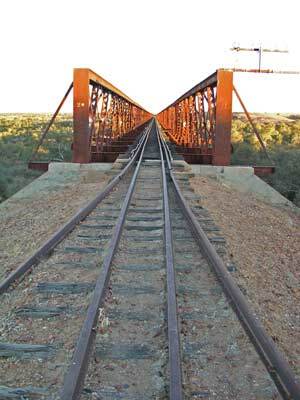 We stop at Warrina Siding which is about 15 kilometres south of the bridge. There is a monument here to the railway. 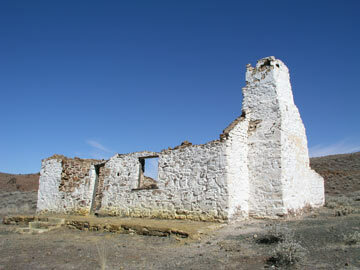 There are also some buildings and a few artefacts from the early 1900s. On the siding there is also a water tank and desalinator for the trains. All the railway buildings are the same design. They were built every 10 kilometres or so for the work gangs to live in. After we leave, we have morning tea along the road. Just under 35 kilometres south of the bridge we come to the road to Peake. 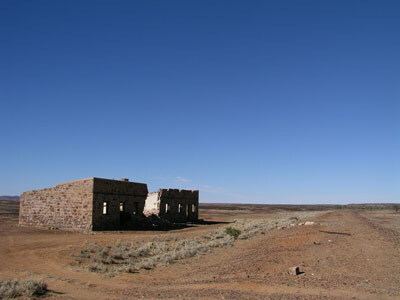 This is an old abandoned mining site and town. 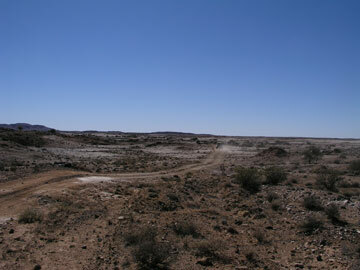 It is 16 kilometres off the Oodnadatta Track along a very rough track. The turn is located at GPS S28° 08' 35.6" E135° 49' 10.6". It takes just over 30 minutes to travel the 16 kilometres due to the condition of the road. 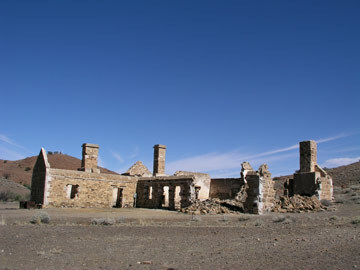 There are excellent ruins, with many buildings and a mine as well as a smelter. It is well worth the couple of hours it takes to get in and out from the Track. You could also camp here as it has some nice spots. 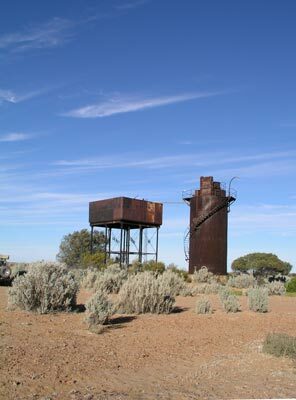 You should walk up to the mine site as well as over to the smelter remains. You can get some nice photographs from up on the hill overlooking the township. 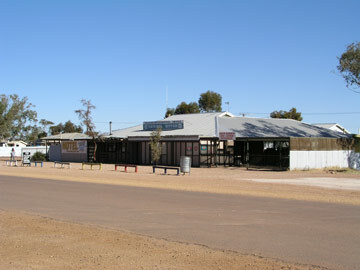 We head back to the Oodnadatta Track. Just before 1 pm we stop for lunch about 9 kilometres further south in a creek. After lunch we continue south to William Creek. It is about 97 kilometres and it takes us about 75 minutes. At the pub there is a bus load of women from a quilting club on their annual trip. There are even women from overseas quilting clubs! The little pub is a bit crowded. We have a beer in the pub ($4.30 a Pale Ale). After a drink, we cross the road and look at the collection of space rockets. 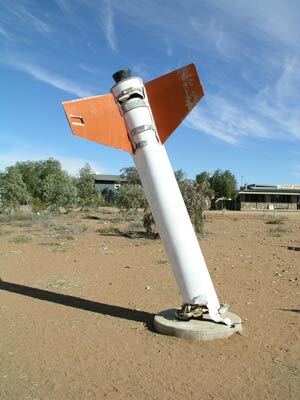 These have been found over the years after crashing when fired from the nearby Woomera Rocket Range. We head off behind the bus, thinking that he will go a lot quicker than us but he stops a few hundred metres along. Someone has forgotten something at the pub. It does not take him long to turn around, go back to the pub and get back on his way. Not too far down the track he is right behind us so we tell him to pass. Along this section of the track there is a rocket launching viewing platform and another station. We stop for a few minutes at both. It is 97 kilometres from William Creek to Coward Springs. 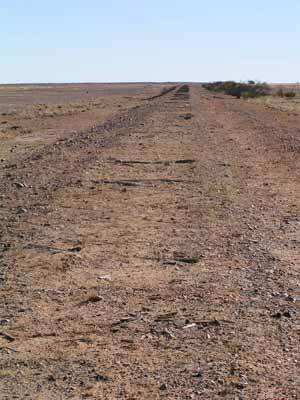 This is another old Ghan Railway siding. At this spot there are a few more buildings than the normal spots. One is the train drivers' house where train drivers slept after they swapped over with a new crew. From memory, there may also have been another larger building. Coward Springs has a bore which lets warmish water come to the surface. The people who have redeveloped this spot into a camping area have built a lot of things out of the sleepers from the old Ghan Railway. 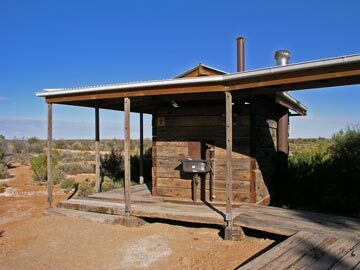 There is a spa (warm but not like other bores to the north in the Simpson Desert), toilets and showers, all built from the slippers. The shower is heated by a small donkey boiler that you add a few small pieces of timber about 15 minutes before your shower. 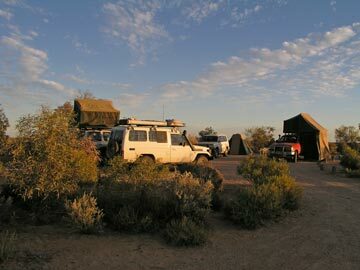 The camping areas is excellent, with lots of trees and excellent wildlife. It cost $6 per person to camp here. I went for a "spa" and it was quite enjoyable. There is also a waterhole here formed from the water overflow. We did a few walks before sunset to look at the abundant birdlife. Frank and I made pizzas in the camp oven for dinner. It took 25 minutes for the first pizza and then about 10 minutes for the next one. A great luxury in the desert! Today's temperature was about 23C.